Bleeding gums and bad breath are the top two concerns many dental patients have. At New Town Dentistry we typically address these issues by talking about five important things you can do to make your gums healthier which will prevent bleeding, and to keep your breath fresh. Often bad breath is a sign that you are not practicing the very best oral hygiene possible, and it can be a sign of periodontal disease. 1. Brush! Start using an electric toothbrush such as an Oral B or Sonicare. These brushes are superior to regular brushing. I recommend brushing at least twice a day and especially at night before you go to bed. This should be the last thing on your teeth before you go to bed. 2. Floss! There is no way around this and there is no substitute. Make a commitment to floss every night for a week and you will make it a habit. Your gums may bleed and may be sore, but it will get better. The floss will not only remove food and bacterial plaque between the teeth, but it also stimulates the tissue and strengthens it, as well as brings oxygen into the gums pockets, killing anaerobic bacteria. 3. Rinse! Start using a mouth rinse as part of your daily routine. Listerine is a very effective product and kills most bacteria in 10-30 seconds. Listerine contains four essential oils: Eucalyptol, Menthol, Thymol and Methyl Salicylate. The combination provides antibacterial, anti-fungal and antiseptic properties as well as fresh breath. Listerine also comes in an alcohol-free version for those sensitive to dry mouth and they also come in a natural rinse for those wanting to avoid artificial flavors and dyes. 4. Identify the problem! Have us evaluate your gums. We will perform a periodontal evaluation and take an honest look at what is really going on. Don’t wait for it to hurt or for loose teeth. We will identify what is going on and provide you with a strategy to beat it. 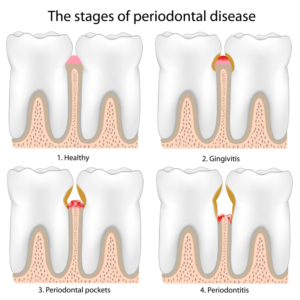 Find out more about preventative care and periodontal disease HERE. 5. Get help! Our hygienists are trained and very sensitive to these issues. They will help you understand what is happening with your gums and bone and provide the correct therapy to help you keep it from advancing. Try these tips and see the results. Taking these extra measures usually works to prevent and put an end to the problem of bleeding gums. Your breath will be extra fresh if you work the practices of regular flossing and rinsing with mouthwash into your routine, as recommended by Dr. Wolfe. If you want to schedule an appointment, contact us or give us a call today! PreviousPrevious post:WHAT IS COMFORT CARE ANESTHESIA?NextNext post:What’s the black line by my crown?